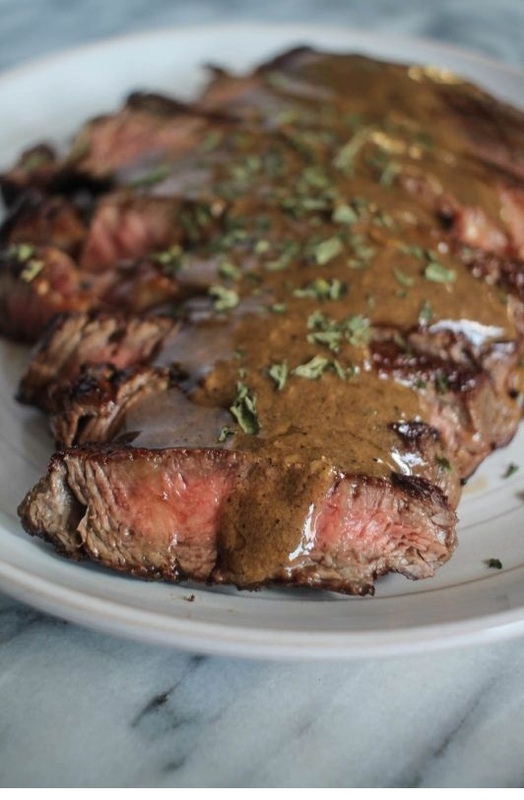 Ribeye Steak with Bourbon Cream Sauce is the ideal special occasion recipe. It feels fancy without being fussy or requiring too many ingredients. Pat the steak dry with a paper towel. Season the steak with the salt and pepper, and rub it into the beef. Melt the half of butter in a pan over medium heat. Place the steak in a hot pan and cook for 2 minutes, then rotate 90 degrees and cook another 2 minutes. Add the remaining butter to the pan, and flip the steak and cook for 2 minutes, rotate 90 degrees and cook for 2 minutes. Remove the steak from the pan, and let it rest for 5 minutes. It should be a perfect medium rare, and register 140 degrees with a meat thermometer. Keep the drippings from the steak in the pan, and add the bourbon, cream, ground peppercorns, and tarragon. Beware that the bourbon might flame up a bit until you add the cream.